November 19, 2015 – United Launch Alliance (ULA) announced today it is taking CubeSat rideshares to the next level by launching a new, innovative program offering universities free CubeSat rides on future launches. 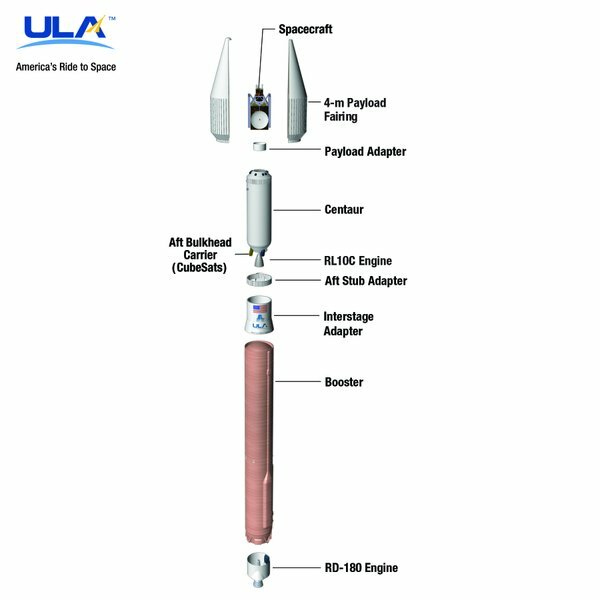 ULA will offer universities the chance to compete for at least six CubeSat launch slots on two Atlas V missions, with a goal to eventually add university CubeSat slots to nearly every Atlas and Vulcan launch. Additionally, the standardized CubeSat carrier will hold up to twenty-four CubeSats, giving companies affordable access to space. “There is a growing need for universities to have access and availability to launch their CubeSats and this program will transform the way these universities get to space by making space more affordable and accessible,” said Tory Bruno, ULA president and CEO. 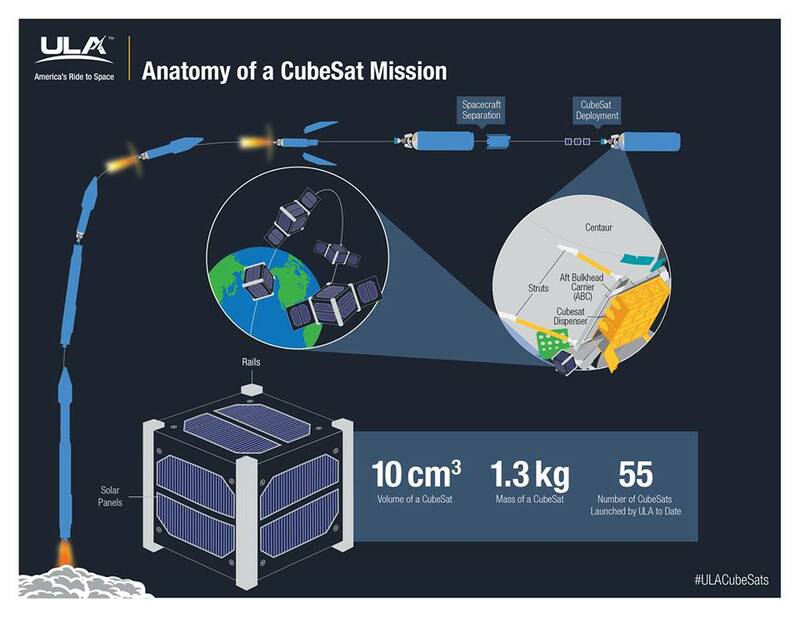 CubeSats are miniaturized satellites originally designed for use in conjunction with university educational projects and are typically 10 cm x 10 cm x 10 cm (4 inches x 4 inches x 4 inches) and approximately 1.3 kg (3 lbs). Since their development more than a decade ago, CubeSats have evolved from tools for instruction into full-fledged scientific platforms. Given their low cost and ease of integration, they have become increasingly more appealing to scientists and commercial space companies. In recent years, NASA and other government agencies have invested more research and development dollars into developing new miniaturization technologies that will support more robust scientific investigations from these platforms. Colorado is a national leader in the aerospace industry. The state plays a critical role in developing the technology and satellites in global weather monitoring, Earth observation and space weather prediction. It’s also home to the Global Positioning System (GPS), which is maintained by Air Force Space Command from Colorado Springs. Colorado is home to the North American Air Defense Command (NORAD), Air Force Space Command, and U.S. Northern Command. Additionally, Buckley Air Force Base is a key space operations center for national security. Colorado also boasts many of the top aerospace companies, including ULA’s headquarters. “Just a scant fifteen minutes from this spot is the single largest concentration of rocket scientists in the nation,” said Bruno, speaking from the state capitol building in Denver, Colorado. Colorado ranked first in the nation in 2014 for private-sector aerospace employment and third in total direct employment of aerospace workers. Colorado has put a lot of emphasis on developing a STEM pipeline, so that students have the training they need to work in this critical state industry. The University of Colorado (CU) and the U.S. Air Force Academy are recognized as having top aerospace engineering programs. CU has nineteen astronaut affiliates, including Mercury astronaut Scott Carpenter and current International Space Station resident Kjell Lindgren. CU is the top STEM major producer in the state and has worked on missions that have visited every planet in the solar system. One of the things that has remained constant about the aerospace industry in Colorado is a remarkable sense of collaboration. Industry leaders look to small businesses and universities to contribute to larger missions, recognizing that smaller businesses can often achieve specialization that results in innovative ways of doing things. Today’s announcement from Tory Bruno is simply a continuation of that long-standing tradition. Rideshare is a flight-proven, innovative approach that provides customers a low-cost way to achieve various mission objectives without the need for a dedicated launch vehicle. Interested universities should email ULACubeSats@ulalaunch.com by December 18, 2015 to notify ULA they are interested in participating. In early 2016, ULA will release a request for proposal (RFP) for the first competitive CubeSat launch slots. The selected universities will be announced in August 2016. In addition, ULA is offering the nation’s universities the chance to help name the new CubeSat program. Universities, educators and students can submit names for consideration to ULACubeSats@ulalaunch.com using a campus-issued email address. Submissions are due by December 18, 2015. The winning name will be announced early next year, and the institution will receive a free CubeSat launch slot on a future mission. As America’s ride to space, ULA has launched 102 missions, including 55 CubeSats, with 100 percent mission success. ULA launches approximately ten Atlas V rockets each year.